Tension set rings are the perfect jewelry selection for a customer looking for something stunning as well as unique. To create a tension set ring, a jeweler suspends the selected gemstone between the two edges of the band. The stone is held in place using the tension from the band itself. As a result, the jewel appears as if it is floating in the middle of the band, resulting in an almost magical look. In addition to being an exquisite design concept, tension setting the stone, also allows the stone to exhibit its shine and brilliance brighter than a stone set traditionally with prongs. The prongs prevent light from being able to flow through the jewel as freely. Tension set rings, on the other hand, are designed to allow the stone to be exposed to more light, creating greater sparkle. However, not all metals are strong enough for making tension set rings. Premium jewelry designer and creator, Titanium Style, specializes in titanium and tungsten jewelry. For tension set rings they use Especially Hard Airspace Titanium Ti-662. This is the hardest grade of titanium available and is able to provide the necessary amount of pressure to hold the jewel in place. 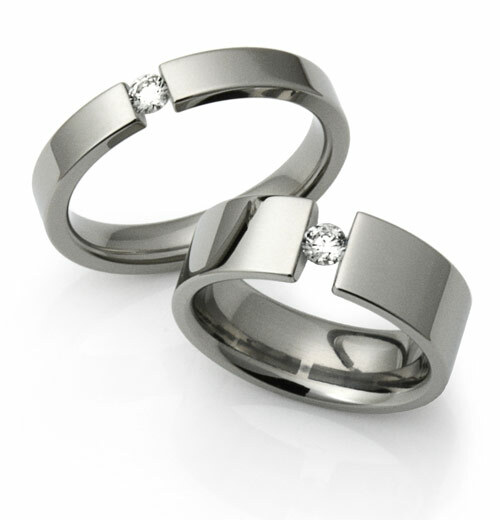 At Titanium Style, tension set rings are all custom made to fit the finger it is meant to be worn on. This gives customer the opportunity to choose the exact features and stone they want, making each ring one of a kind. A customer can start by deciding on whether or not they want to add an inlay of another metal. 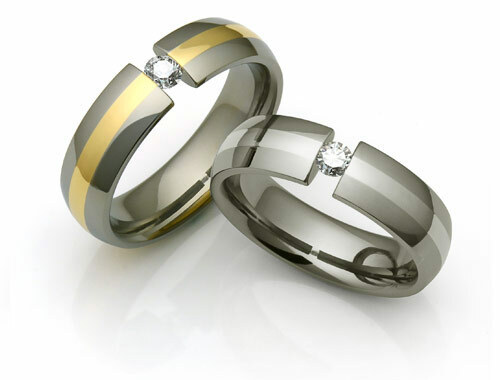 Depending on the look desired, they could choose an inlay of yellow or rose gold, which would result in a creating a contrast to the smooth silvery color of the titanium. 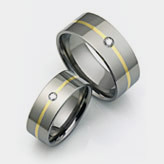 For a more subtle effect, they could choose an inlay of platinum or silver, which is closer in color to the titanium. The inlay can be raised, slightly higher than the rest of the band, or can be set deeper, in a channel. The customer can pick out the stone they would like set in the band. Choose from high quality diamonds, rubies, emeralds, or sapphires. The experienced jewelers at Titanium Style can help guide you as you decide on size, shape, and color of the jewel. 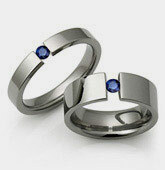 Other decisions include choosing the style of the edges of the ring and the finish. There are so many combinations, every tension set ring is completely unique. All of Titanium Style’s rings are hallmarked with their grade of titanium and karat mark, guaranteeing the purity and quality of the alloys used in their making. 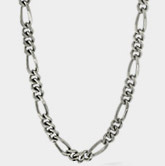 They also offer a Lifetime Warranty on their jewelry to protect the buyer against any manufacturer or material defects. Well-constructed tension set rings will last a lifetime.